Imported car sales in South Korea surged almost 76 percent from a year ago in January, but they fell nearly 10 percent from December due to the end of tax benefits for passenger cars. The total number of foreign cars sold here in January stood at 3,448, a 75.5 percent increase from a year ago. German-made cars drive competition in the local import market, where BMW, Audi, and Mercedes-Benz occupied the top three positions in the number of cars sold in January, according to the Korea Automobile Importers and Distributors Association (KAIDA). BMW sold 610 cars here last month, ranking first. Audi was the runner-up with 541, followed by Mercedes-Benz with 464. Lexus came fourth with 433, followed by Volkswagen (255), Honda (229), Volvo (211) and Chrysler (177). KAIDA attributes the increase to the fact that imported cars were sold at a price reflecting a lower excise tax during the month even after the government restored the tax early this year. But the figure was down 9.5 percent from December's 3,811 units as the government's temporary tax cut on cars and luxury goods ended as of Dec. 31. 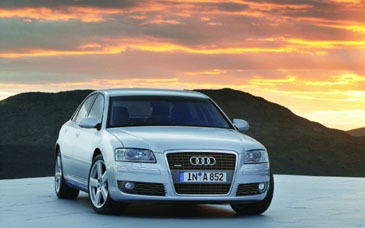 Audi's 2.4-liter A6 sedan ranked No. 1 in monthly sales for the first time since the German giant established a local subsidiary Audi Korea Ltd. in Oct. 2004, the association said. "Although sales dropped slightly compared with December, the upward trend will likely continue throughout the year," said Yoon Dae-sung, the association's managing director. Brisk sales of imported cars strike a sharp contrast to poor performances by domestic car manufacturers. In January, South Korea's five car manufacturers posted combined domestic sales of 82,897 units, up just 2.4 percent from a year earlier. South Korea's imported car market is forecast to grow 15 percent in 2006 to 34,500 units, the association said. Ford Motor, in the midst of restructuring its workforce in the United States, looks at South Korea as one of several key strategic markets despite hardship back home. Its focus on the Korean market is indicated by the company's car-unveiling plan here in 2006. The world's third-largest automotive group, with brands such as Lincoln, Jaguar, Land Rover and Volvo, will launch 22 new mew models here. The figure of 22 is equivalent to 27.5 percent of the total, or 80 models, projected to be imported here. "Ford has no plan to cut the payroll in Korea. We (Ford Korea) have seen sales growing fast since last July," a company spokesman said. Ford Korea sold more than 500 units of the Five Hundred sedans over the past several months. The New Mondeo sedan of Ford unit, unveiled in January, is attracting a variety of motorists with its stylish design and price of about 27 million won ($28,000). The main unit of the group will launch three more models, including the Freestyle crossover vehicle (sport utility type + wagon type) slated for late February, this year. Affiliate Lincoln showcased the LS V8 sedan on Feb. 1. Ford Motor's British and Swedish units — Jaguar, Land Rover and Volvo — are also active in marketing in Korea compared to past years. Jaguar, which unveiled the X-type 2.1 in January, plans to launch another sedan, XJ 3.0 SWB, on Feb. 13. It will begin selling four more new models, such as XJ Daimler and New XK Convertible, during the second and third quarter. Land Rover, which captures a great portion of imported sport utility vehicle (SUV) market here, will showcase the Range Rover Sport V8 in April and four more models in November. Volvo Car Korea is leading the enhanced sales. It unveiled four models, including two sedans and two SUVs, last month and is aiming to introduce two more in April and May. The Premier Automotive Group (PAG) Korea, a combined dealer of the three European cars, is pushing for opening of sales branches nationwide under the management of CEO Lee Hyang-lim. Ford Motor's challenge in Korea could be likened to that of General Motors, the world's largest but struggling carmaker. Despite the parent GM's cash flow crisis in the U.S., GM Korea will launch nine models of three units _ Cadillac (two models), Chevrolet (one) and Saab (six) _ this year. Volvo occupied the No. 1 spot in sales of tax-free cars to foreigners in South Korea among 21 imported brands here last year, beating BMW and Lexus. The Swedish carmaker, a unit of U.S. Ford, sold 183 vehicles exempted from a variety of taxes in 2005. It is also considered to ranked first over the past few years by selling 82 units in 2002, 135 in 2003 and 165 in 2004. Foreign carmakers are selling tax-free cars mostly to embassy officials and senior U.S. soldiers here. "We strictly screen the eligibility of consumers. The majority of foreigners cannot buy the tax-exempted cars," a Volvo Car Korea spokeswoman said. She attributed the best performance to top-level safety of vehicles of Volvo as the pioneer of the tax-free imported cars in Korea. The buyers enjoy a 15-20 percent discount compared to tax-levied vehicles. While most foreign carmakers do not perform in the tax-free market, imported-car dealers estimated that BMW and Mercedes-Benz ranked second and third last year. BMW Korea official said it sells about 100 tax-free units per annum. Toyota Motor' s Lexus, which took the first place by overtaking BMW in the 2005 tax-levied vehicle sales, said it sold 12 tax-free units last year. Its annual sales in the tax break market ranged between seven and 16 since 2001. A spokesman of Mercedes-Benz Korea said its basic policy is not to state the tax-exempted car sales, citing a possibility of leakage of personal information involving diplomats propensity to spend. Hanbul Motors Corp., the Korean importer of Peugeot, sold 21 tax-exempted units, involving rental cars, last year. "`We push for rent-a-car services in Cheju Island in the tax-free market." Officials at Ford, Honda, Saab and Daimler Chrysler said the number of units to be sold via tax credits here is marginal, similar to Lexus. A Ford Korea spokesperson said the tax-free sales are equivalent to less than 5 percent of its tax-imposed sales of 1,353 units recorded in 2005. Aside from diplomats and U.S. soldiers, Korean people of national merit and disabled people can enjoy partial tax break in their purchase of imported automobiles. In the meantime, French carmakers are poised to wage sales battles with German and Japanese competitors in South Korea while Citroen, one of the three major French auto brands along with Peugeot and Renault, to enter the domestic market this year. Officials at Hanbul Motors Corp. say Peugeot's Korean importer is preparing to introduce Citroens this year. They are presently fine-tuning import conditions and the launch date with the French automaker. Citroen is a unit of PSA Peugeot Citroen, Europe's second-largest carmaker. Though a Korean importer had sold several Citroen models in Korea, the number of imported units was marginal. Sales were suspended in 2002. With its systemized sale networks amid rising market share for Peugeot, Hanbul Motors is now aiming to situate Citroen as one of its strategic import brands. The Korean importer plans to focus its marketing strategies on motorists who want stylish models. The Citroen C6 sedan was named Beautiful Car of the Year at the International Automobile Festival in France on Jan. 18. The PSA Group is turning its eyes from the EU market to overseas with last year's launch of several new models. Among the popular models are Peugeot's 407 saloon, 1007 small car with electric sliding doors, small 107, Citroen's C1 city car, 407 coupe and luxury C6 limousine. Peugeot's new 607 sedans, unveiled on Jan. 12, is drawing keen attention from Seoul motorists. It will launch another six new models, such as the 207CC, 1007, and 307 Hdi, this year. Renault has already penetrated a large portion of the Korean market with its Renault Samsung brand here and Peugeot ranked 10th in sales among 21 foreign brands in 2005. While German and Japanese automakers, including BMW, Mercedes-Benz, Toyota (Lexus) and Honda, grasped the majority of the market, it is a matter of concern as to how the French players will find a niche, and with what kinds of marketing tactics.